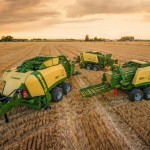 Krone has unveiled its new generation of Swadro rotary rakes, including the Swadro Trailed Center (TC) and Swadro Trailed Side (TS) models. 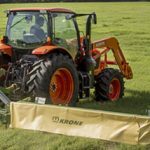 According to Krone, the new rotary rakes are ideal for medium to large dry hay or silage producers who require even and consistent windrows. 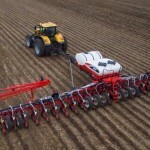 Krone boasts that the Swadro TS rakes have the capability of making one or two windrows and raise over 19 inches for high ground clearance during headland turns so windrows are not damaged. In addition, the leading rotor rotates at higher speeds than the other rotors, which Krone says ensures greater efficiency and throughputs. 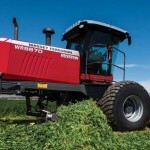 “The Swadro TS rakes also enhance flexibility in allowing growers to change from single windrow formation to double in less than one minute,” said Raines. 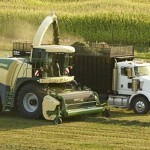 The Swadro TC rakes form one windrow down the center of the rotors. The new feature on all Swadro TC models is manual height adjustment located on the rotor with a height indicator displaying the current adjustment. 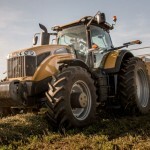 All of the new generation models feature a new curved tine design that picks the crop off the ground to minimize contamination and improve the forage quality. All new Swadro models have a reduced transport height of less than 13 feet.